I’m sure most polish enthusiasts have already heard about Zoya’s great offer, but just in case you haven’t through January 9 Zoya.com is offering two free bottles of polish per customer/household. All you have to do is pay $6.95 for shipping. Just pick any two colors you would like (excluding True and Fleck Effect Collections) and add them to the cart. 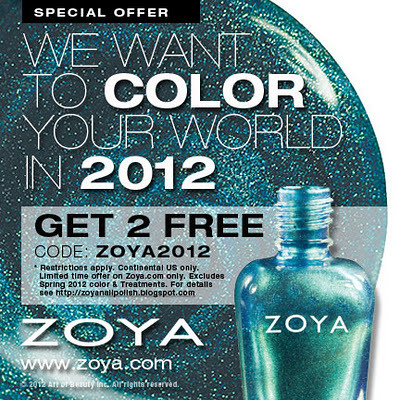 Then you have to enter code ZOYA2012 at checkout. This is a great deal considering Zoya polishes normally retail for $8 each. I have not tried Zoya polishes yet, but this was a deal I could not pass up. I decided on the polishes Charla and Gemma. Charla is described as: a tropical blue sparkling metallic. An expensive-looking metallic shade for summer. The color reminds me of the Disney movie The Little Mermaid on the website. Gemma is described as: a light muted olive-green with an overlay of blue and violet duochrome shimmer. Unique, hip and cutting-edge yet subtle enough to suit any wardrobe. I picked this mostly because of the light shimmer in the bottle, the name, and the fact that I am lacking greens in my collection.